With one swing of the bat, Carlos Beltran has arrived as a Yankee. On Friday night, with the Yankees down by one run and two outs in the bottom of the 9th inning, Beltran crushed his most important hit to date into the left center stands with two on to give the Yankees a 5-3 win over the Baltimore Orioles. For many new Yankees, Masahiro Tanaka excluded, it takes a while to get acclimated to pinstripes. I remember that it took Jason Giambi a season or so to really feel comfortable. Brian McCann started his Bronx career a little on the slow side, and in many Fantasy Baseball rankings, his replacement in Atlanta and former backup, Evan Gattis was rated higher among catchers. He delivered a key hit this past week to win a game and perhaps that was his “moment”. He is starting to hit so there’s no reason not to believe that he’ll be an offensive force for the remainder of the season. But Beltran came with high expectations even at his age. Not to say that McCann didn’t, but perhaps the bar is a little higher for Beltran given his history in the City with the Mets. Ironically, Beltran may never have gotten his “moment” if not for a clutch RBI single by McCann in the prior at-bat. The game had many heroes. A diving stop by Jacoby Ellsbury that could have easily bounced past him to allow more Oriole runners to score in the late innings, David Huff limiting the O’s to one run in the top of the 9th after an error by Yangervis Solarte, and the very strong performance by Hiroki Kuroda. Conversely, Solarte could have been the goat with the error, in combination with his inning ending at-bat with two on in the bottom of the 8th. Nevertheless, at the end of the day, the Gatorade was dunked on Beltran and all was good in the Bronx. I like Francisco Cervelli as backup catcher given his versatility. But it was still sad to see John Ryan Murphy sent down to AAA. I know, he’ll get the chance to start every day, but I thought he did a great job backing up McCann. I know that when the Yankees make a deadline move in July, it will almost certainly include one of the young catchers (Murphy or top prospect Gary Sanchez). If the Yankees somehow swing a deal for David Price (unlikely in my opinion), Sanchez would have to be one of the pieces headed to Tampa. But in other deals, it’s more likely that Murphy will go unless the Yankees move Cervelli. Austin Romine seems to have become an afterthought. Hats off to the young Yankee pitchers. Entering the season, the bullpen was perceived as a weakness but young arms Dellin Betances and Adam Warren have become go-to guys, and represent superior upgrades to guys like Joba Chamberlain and other former relievers. But the biggest surprise is how well the replacement pitchers, Chase Whitley and David Phelps in particular, have performed. Vidal Nuno has done a decent job but he is the top candidate to go to the pen or to AAA when CC Sabathia returns after the All-Star break. 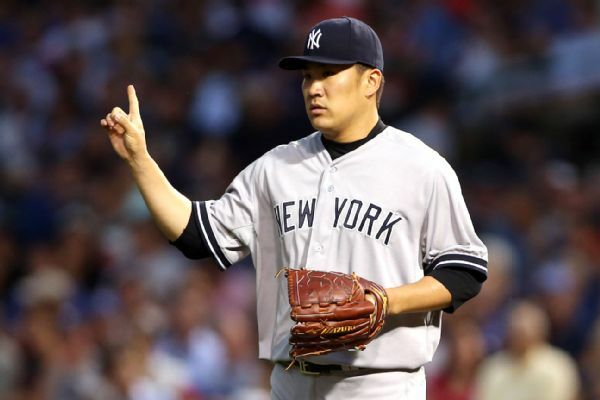 It’s almost a given that the Yankees will pursue another starting pitcher in July but the reason the Yankees are buyers and not sellers is directly attributable to the support that Whitley and Phelps have provided for ace Masahiro Tanaka and Hiroki Kuroda. I am glad to see that Phil Hughes has found a home in Minneapolis but I am among those who believe his strong performance would not have happened in the Bronx. I wish that he could have worked out for him, but he did need the change of scenery. It wasn’t that long ago that Hughes, Ian Kennedy and Joba Chamberlain were cited as the next great Yankee pitching hopefuls, and now they play in Minnesota, San Diego and Detroit, respectively. The only one that the Yankees received a return for was Kennedy and in retrospect it was not for market value. Kennedy went to the Arizona Diamondbacks and Phil Coke and Austin Jackson to the Detroit Tigers when the Yankees acquired Curtis Granderson. Given that Granderson left as a free agent, the Yankees essentially have nothing left to show for the losses of the three former top prospects. I have to admit that I had almost forgotten about Alex Rodriguez (it was nice) until I heard his name yesterday after it was announced that he had dropped his lawsuit against the team’s doctor. I don’t know what A-Rod has left in his bat but honestly I do not care. I am not looking forward to his return next year and remain hopeful that the Yankees will find a way to sever ties. But I know that’s wishful thinking on my part. For now, I just have to enjoy that the team is doing fine without A-Rod and know that he is not missed. 2014 has been a year of disappointment for many. Pitchers are lining up for Tommy John surgery at an alarming rate and proven star performers like Prince Fielder and Bryce Harper are on the DL. Certainly, the Boston Red Sox rank of one of the year’s greatest disappointments (as discussed in Nick Cafardo’s column today in the Boston Globe). I realize the team has struggled with the losses of Jacoby Ellsbury and Jared Saltalamacchia, but the effort and focus of the team collectively seems to be lacking. I know, a Yankee fan making negative comments about the Red Sox…shocking. 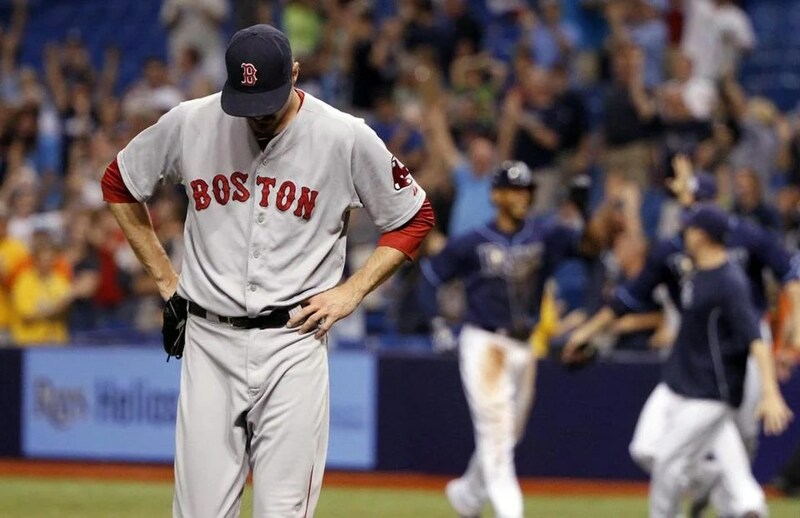 But still, watch the 15th inning of yesterday’s Sox-Rays game seemed to be a microcosm of Boston’s season. While everyone was critical of reliever Andrew Miller’s errant throw at second base that allowed Tampa Bay to score the winning run, it was an earlier play that I felt was equally as critical. The Rays laid down a perfect bunt toward third and Miller had the closest line to the ball, yet he pulled up and didn’t make an attempt for it. It appeared to me that they would have been able to record an out had Miller gone for the ball, but instead the runners advanced. Sure, the loss cannot be placed on Miller alone. But it was a random sample of what ails the Sox. I know better than to ever underestimate the Red Sox. They’ve overcome adversity too often to think their season is done. But they need to find the “magic” soon if they intend to defend their crown. Of course, as I write about the Red Sox, my team…the Yankees…have their own problems. Entering the season, there were two primary concerns: the infield and the bullpen. The latter has become a strength with the emergence of young relievers like Dellin Betances and Adam Warren. I have lost no sleep about Joba Chamberlain being in Detroit, whlle Betances has become a late inning force. David Robertson has been very effective as Mariano Rivera’s replacement (regardless of the two run walk-off home run by Chicago’s Adam Dunn the other night). But time will tell how long it will hold up with the collapse…at least injury-wise…of the starting rotation. With CC Sabathia, ivan Nova and Michael Pineda on the DL, the bullpen has lost reliable arms to the rotation (Vidal Nuno and David Phelps). The Yankees ability to find a permanent solution for the losses of Sabathia and Nova and the successful return of Pineda will go a long way toward determining where the Yankees will be in late September. In a way, it was good to see Masahiro Tanaka finally lose his first regular season game since 2012. The streak was becoming the focus and with it, a distraction. Everyone has a bad day and Tanaka is no exception. But now, he can just pitch and continue to improve his game without the added pressure of maintaining the streak. The loss was inevitable and the many storylines about it have been written. Let’s move on. This morning, I saw a post on the MLB Trade Rumors website (http://www.MLBTradeRumors.com) that asked the poll question of which MLB team had the best draft in 2002? Of all the examples shown, no Yankees were anywhere to be found. For a draft that started with Bryan Bullington and B.J. Upton, there was some great talent uncovered in the 2002 draft. Jon Lester, Zack Greinke, Matt Cain, Prince Fielder, Cole Hamels, Joey Votto and a guy who would eventually find his way to the Bronx, Brian McCann, were among the great choices by their respective teams. But sadly, not a single Yankee selection stuck that year. Number 26 selection Phil Coke is a major leaguer but with the Detroit Tigers. He had his moments in the Bronx but was never anything special and was sent to the Tigers as part of the Curtis Granderson-Austin Jackson trade. But removing Coke, there are 50 rounds of names that Yankee Stadium never heard from. I really do not recognize any of the names outside of the first round selection and that’s only because he was later the starting quarterback of the Cleveland Browns (Brandon Weeden). I know that there are many sad tales among the 2002 draft picks, like 2nd round pick Alan Bomer, a pitcher, who reinjured his shoulder after a previous injury several years earlier, bringing an end to his major league hopes. But it’s also a testament to the drafting ability of major league teams and 2002 was clearly not a good vintage for the Yankees. I know the team’s re-focus on the minor league system didn’t occur until a few years later but hopefully barren draft years like 2002 are a thing of the past. But looking ahead a few years, it’s not too pretty. 2003 really wasn’t much better with top pick third baseman Eric Duncan long gone from baseball. The only name that stands out to me from that draft is Washington Nationals reliever Tyler Clippard. 2004 was the year the Yankees selected pitcher Phil Hughes and can only wonder what could have been. Time will tell if he can fulfill his promise in the Twin Cities or if he was simply one of the most overhyped young players of our time. For the Yankees, solid draft picks do not appear until 2005 which Brett Gardner and Austin Jackson were chosen. Interestingly enough, the Yankees also chose pitcher Doug Fister that year but he opted to return to college for his final year, and was taken by the Seattle Mariners the next year. Granted, Fister is currently on the Nationals’ DL, but he’d certainly look good in the Yankees rotation about now. In 2006, the Yankees made some good choices, but it’s rather humorous that the first round pick went to Joba Chamberlain, a journeyman reliever for the Detroit Tigers, while current Yankees closer, David Robertson was selected in the 17th round. Ian Kennedy and Zach McAllister were both chosen after Chamberlain, and they are solid starting pitchers for the San Diego Padres and Cleveland Indians, respectively. Dellin Betances was also taken that year and after years of hype, he’s finally contributing as a force in the Yankees bullpen. Mark Melancon, currently the closer for the Pittsburgh Pirates due to Jason Grilli’s injury, was also a draft selection. Of the decisions the Yankees made regarding trades, the one I didn’t like was dumping McAllister. He went to Cleveland in 2010 for Austin Kearns who only stayed in the Bronx for the remainder of the season. That trade felt like the foolish ones that we had grown accustomed to in the 1970’s and 80’s. McAllister is having a very solid year for the Indians and is another guy who would have looked great in the Yankees rotation. I will never find fault with the decision to trade Ian Kennedy even though he almost won the Cy Young after leaving the Yankees. I just never found him to be a good fit in New York. 2007 was another disappointing draft year as the Yankees really only have catcher Austin Romine, currently at AAA Scranton/Wilkes Barre, to show for it. Top pick Andrew Brackman was coming off a major injury at the time of the selection and was never able to find his way back. This really shows how incredibly difficult it is to determine those who will be able to achieve results and success at the Major League level. It also shows how many people fail to find their way for whatever reasons. It’s a small wonder that the Yankees have had to spend so much in the free agent market to ensure the team remains competitive. In a statement of the obvious, the Yankees would be smart to improve the quality of their scouting and development to ensure that the older players are replaced by younger, cheaper talent with high ceilings. The Tampa Bay Rays and Kansas City Royals are solid teams because of their drafting ability. For the Yankees, they are successful despite it. I get why owner Hal Steinbrenner believes in the power of the farm system. This is not rocket science. Sustainability will only be maintained through youth and controlling costs. The fans of the Boston Red Sox took great delight when Michael Pineda was tossed from a Yankees-Red Sox game last week due to the blatant smear of pine tar on his neck. After the fiasco caused during his previous start against the Red Sox in Yankee Stadium (“brown dirt”), he had to have known he would be under the magnifying glass. Yet, he risked detection by continuing the use of pine tar and ended up applying a more generous amount than he had intended to. So, Boston manager John Farrell had absolutely no choice but to call out Pineda. This is one instance where I felt the Red Sox were 100% correct in a controversial decision involving the Yankees. Pineda’s 10-game suspension hurts the Yankees, at a time when they’ve already lost starter Ivan Nova for the season due to an elbow injury that requires Tommy John surgery. For a rotation that looked so strong and full of promise for a few starts, the Yankees now have to replace both Nova and Pineda, plus the top of the rotation has been questionable at times with CC Sabathia and Hiroki Kuroda. The only source of consistency has been Masahiro Tanaka, who faces an incredibly difficult challenge today against the Los Angeles Angels and the likes of Albert Pujols and Mike Trout. Baseball is a team-first sport and Pineda made a “me-first” decision. I hope that he learns a valuable lesson during his suspension and comes back with choices that are for the good of the team. For the record, I do believe that Major League Baseball should allow pine tar to some degree for gripping purposes only in colder temps. But until the rules are changed, it’s a violation and should be handled accordingly. Baseball has been tolerant of discreet behavior regarding its use, but to blatantly violate the policy warrants the appropriate punishment until such a time the rules are changed. For Yankees fans, the off-season started nicely. After early speculation that manager Joe Girardi might jump to the Chicago Cubs, he re-signed a long-term deal with the Yankees and expressed it was his desire to remain in New York. All good. Then, Derek Jeter quickly signed a one year deal with negotiations that where smooth, quick and efficient (unlike the prior Jeter negotiations). It remains to be seen if we’ll get the Jeter of 2012 or the injured, aging 2013 model, but there’s no question that Jeter must finish his career in pinstripes. I don’t think Derek would want to go anywhere else at this point anyway, but still, he is the face of the franchise and he’ll forever be remembered as one of its legends. In the distant future, when the old greats from the 50’s Dynasty era are gone (Yogi Berra and Whitey Ford, among others), it will be guys like Jeter that maintain the honor and tradition in baseball’s most storied franchise. The Yankees struck fast in signing free agent catcher Brian McCann after last year’s parade of backups in the starting role. It gives the team its first legitimate starter at the position since Russell Martin left, and the best offensive bat at the position since Jorge Posada retired. This is a move that places backup catchers Francisco Cervelli, J.R. Murphy, and Austin Romine in a better position to succeed. At first pass, I expect Cervelli to take the backup job in spring training but the other two are capable. On the days that McCann slides to DH, the catching position will be capable hands. Next came a big surprise. I honestly did not see the Yankees signing centerfielder Jacoby Ellsbury. 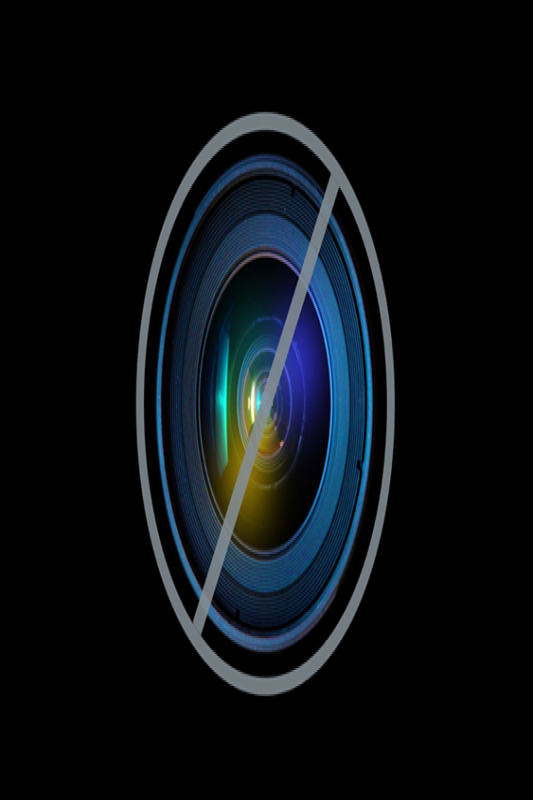 While I have been a fan of Ellsbury’s work, it didn’t seem to be a great need for the team. Brett Gardner has been an effective centerfielder, and has the speed to burn. Still, Ellsbury’s signing upgrades the position and allows the Yankees to slide Gardner to left where he a defensive upgrade over Alfonso Soriano. The concern here is that by making Soriano the full-time DH, it does limit the DH opportunities for Derek Jeter and Brian McCann. Soriano’s bat is still very valuable, and it’s much needed in the lineup. Then came the bittersweet day of Friday, December 6th. The night before, there had been reports that second baseman Robinson Cano had flown to Seattle, but in the morning, the early reports indicated that talks had stalled or perhaps even ended. It gave a brief ray of hope that he’d come back to the Yankees, but those hopes were soon dissolved when it was reported Cano had agreed to a 10-year $240 million deal with the Mariners. While it’s tough to lose a great player, perhaps the team’s best, it is simply too hard to justify those numbers. I have enjoyed the early 30’s version of Cano at second, but in his late 30’s and early 40’s, the prospect doesn’t look too promising at $24 million per year. That’s a huge chunk of any team’s overall payroll. I think of when Chase Utley was the premier second baseman, but now, with injuries, he has become a shell of what he once was. What happens if Cano does not age well? I guess I am not a gambling man and would prefer that the M’s take that bet. $240 million can be better spent by spreading it over multiple positions rather than locking it into only one. This is where I find Robinson Cano to be extremely selfish. You can’t begrudge anyone from wanting as much money as they can get, but this is a team game and every team has a budget…even the Yankees. If it were me, I would have taken the Yankees offer of 7 years at $175 million because the average annual salary was stronger and I’d know that the team would be more flexible in other areas by not being locked into so many years. For those additional three years, it would be up to me to perform and if so, there would be a reward. 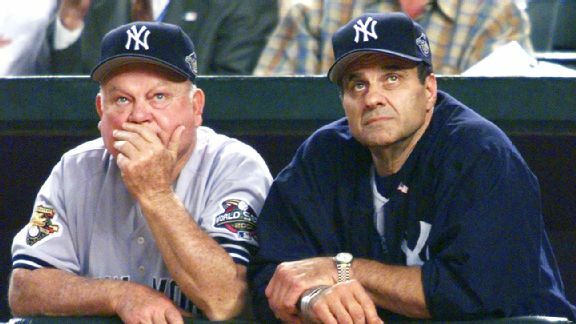 It also would have kept the Yankee legacy intact and ensured a potential place among the team’s legends. But now, Cano is just another player who took the money and ran. He proved that money is more valuable than wins, and money is more important than helping build a strong supporting cast of quality players. That doesn’t mean Seattle doesn’t have quality players, they do, but they are a long way from contending. It is very possible that when they are ready to contend, Cano has started his career regression due to age that’s inevitable for everyone. Cano has carried the “lazy” rap for years. While he is an exciting player at times, it was frustrating when he didn’t hustle. I think of someone like Dustin Pedroia, whose motor is always running. He creates opportunities that otherwise wouldn’t be there because he is alert and proactive. He seizes the opportunities and takes advantage of them. That’s what winning ball players do. Cano is not that guy. I have never thought of him as a team player, and I didn’t view him as a player who helped raise the performance level of those around him. Rest assured the Yankees will miss his offensive production at the position. At this point, I have no idea who will be the second baseman in 2014. Kelly Johnson seems better suited to help replace Alex Rodriguez at third base, in a platoon situation. Omar Infante signed a four year deal with the Kansas City Royals, and Brandon Phillips is starting the downward slide that comes with age. David Adams, a young player who had the talent but couldn’t show it at the major league level during brief auditions, was non-tendered and is now a Cleveland Indian. It looks as though the Yankees will fill second base with a bargain basement fill-in, much like they did last year with first and third bases. I wish the organization was better stocked with up and coming second base talent, but that does not appear to be the case. I personally thought Infante would have been the best short-term option, but the Yankees allowed them to get beat by the Royals in signing the player. You know it’s an odd year when the Yankees get beat in free agency by both the Royals and the Mariners. But enough about Cano, he is gone and so is his Yankees legacy. Around the same time as the news had broken about the former second baseman signing with Seattle, it was reported that starting pitcher Hiroki Kuroda had signed a new one year deal with the team. This was very good news to hear. Kuroda is much needed, and I am grateful that he chose to delay his return to Japan by a year or head back to his home in Southern California. So, Cashman has filled 200 of the 400 innings he previously stated were needed this off-season. After the tumultuous events of the day, news broke on the evening of December 6th that the Yankees had signed outfielder Carlos Beltran. At 36, he is no longer the player he once was, but he is a “gamer” or as George Steinbrenner would say, a warrior. Even an aging Beltran is an upgrade over an even older Ichiro Suzuki or the outfielder still primarily funded by the Los Angeles Angels, Vernon Wells. But after the three free agent signings, the news has mostly been about departures. Phil Hughes was the first to depart, signing a three year deal with the Minnesota Twins. It was probably a good move for Hughes. Minnesota will be less pressurized and he should have the opportunity to flourish, much like Carl Pavano was able to resurrect his career in Minneapolis after leaving New York. I certainly did not expect the Yankees to re-sign Hughes after the season he had last year, but I thought he’d go to Southern California and saw the San Diego Padres as a good fit. Nevertheless, Minneapolis is a fun city and it’s a good ballpark. A couple of other notable defections occurred in the bullpen, where Joba Chamberlain signed a one year deal with the Detroit Tigers and Boone Logan went for three years with the Colorado Rockies. Of the two, it is Logan that I really hated to see leave. He was a trusted left-handed reliever, but it really didn’t seem like the team made much of an effort to retain his services. They obviously had other priorities, but I suppose the Yankees are hopeful that a less expensive options like Cesar Cabral will step up to fill Boone’s role. It was a foregone conclusion that Joba had thrown his last pitch for the Yankees. But admittedly, I was surprised he went to Detroit. There are worse things to do than to go to a team that is probably the best one in the American League right now, but I thought that Joba would go to the Kansas City Royals since it is closer to his hometown roots. The one year deal does give him an opportunity to try and restore the promise he once had with the Yankees. Plus, if he wins a World Series, it will help give his career a further boost. The Yankees also lost last year’s starting catcher when they traded Chris Stewart to the Pittsburgh Pirates. This move was a given after the McCann signing combined with the surplus of backup catchers. For as crazy as December started for the Yankees, the week of the baseball winter meetings was extremely quiet. The Yankees still have much work to do. On paper, after consideration of all plusses and minuses, they are not noticeably better than last year’s 85 win team. They still need a quality starting pitcher, a second baseman, and bullpen help. Brian Cashman has his work cut out for him between now and spring training. I honestly do not know where the Yankees will go from here. I’d like to see the free agent signing of a pitcher like Matt Garza, but so far, the Yankees have not been one of the team’s linked to the pitcher. Same with Bronson Arroyo, who is certainly capable of eating a large number of innings as a #4 starter. For second base, the latest reports have the Yankees interested in Darwin Barney of the Chicago Cubs but I have no idea what he would cost in terms of talent in a trade. I will feel much better about the 2014 Yankees once the additional starting pitcher and second baseman are in the fold, but at least it is reassuring to know that Hal Steinbrenner wants to win as much as the rest of us do.